1. Open the Snap course that you need to make admin changes to. 2. Click the Admin settings button in the to right corner of the Snap course window. 3. The available Admins settings will appear in a list. Course Completion: this link takes the user to the page that allows editing to the completion settings of the course. Users: This collapsible sub-menu allows the instructor to enroll other users and manage groups. Contains links for enrolled users, enrollment methods, groups, permissions, and other users. Reports: Contains links for logs, live logs, activity reports, activity completion reports, and statistics. 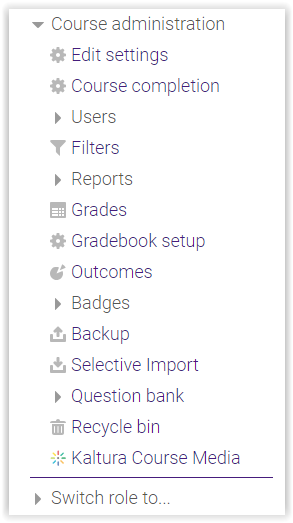 Gradebook Setup: Allows the user to edit the assignments in your gradebook. Outcomes: this link brings the users to the outcomes page, where outcomes for the course can be added/removed. Backup: brings the user to the course backup settings page. Kaltura Course Media: brings the user to the Kaltura media page where video files can be uploaded and shared to the course.